Lloyd Turner attended the University of California, Berkeley School of Architecture, married his college sweetheart Ann, and practiced architecture in the San Francisco Bay Area until his retirement in 1986. In private practice Lloyd designed residences and institutional projects. During this same time he invented various commercial products - from electric vehicles and child proof containers to flying toys. He has 14 patents and has illustrated one book. Most of his inventions are still on the market, one is a worldwide standard. Lloyd has taught illustration as a lecturer in the Art and Design Department, University of California State College at San Jose, from 1987 through 1995. 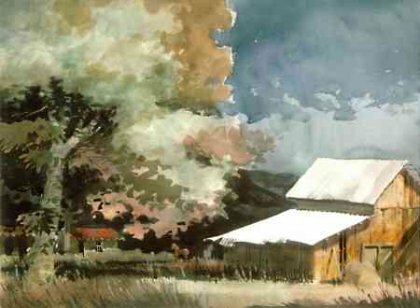 The San Lorenzo Valley, where Lloyd lives, is home to a group of artists who regularly paint together, exhibit together, and offer classes to the public. In the old days they used any building that was available for classes and exhibits: fire stations, libraries, or abandoned post offices. A few years ago their classes were being held in a county facility when the use fee suddenly increased, Once again they were out on the street. Lloyd was instrumental in establishing a permanent art center which is now wholly owned and operated by the members: the Santa Cruz Mountains Art Center, in Ben Lomond. Calif. Throughout Lloyd’s whole life he has been unsure whether his real interest has been architecture, inventions, or art. He’s concluded that his interest is creativity.